Keizan the Dhyâna-master, the founder of the Sôjiji, the sister monastery of the Eiheiji, and the 4th Patriarch of the Sôtô sect in Japan, was born in the year 1268 in Tane village, of the province of Echizen. His family, the Uryûs were descended from the house of Fujiwara, Uryû Tamotsu, a well-known loyalist who lived in the 14th century, being of that stock. His mother, being somewhat advanced in age, and childless, was very much anxious to have one for which she prayed to Kwannon or Avalokitesvara in her village, every day reading Samantamukhaparivarta 33 times, and worshipping the Bodhisattva as many as 333 times. Her devotion seems to have been responded to, for one night she dreamed a marvellous dream, in which, she thought, she swallowed the sunlight, and was blessed with a child. Then, it is said, she offered up a prayer to the same Bodhisattva to the effect that if the child conceived were to become a wise man it might be naturally brought forth, if not, it should expire in the womb and be born dead. At the moment of the birth, it is recorded, a wonder was witnessed ; clouds of a purple colour were seen hanging, and a strange odour was smelt all over the room. His parents were too glad to obtain a son in such a miraculous way, and brought him up under a special care. Whether it was because the child was born in response to a prayer to Avalokitesvara or not, when he was still in his mother's bosom, he used to repeat Namo, and when he was 4 or 5 years old, quite unlike other children, he played making a heap of pebbles, in miniature of a Dagoba or moulding clay into figures like Buddhas' images. While his parents read Sûtras or worshipped Buddhas, he was always seated besides them, and it was a special delight for him to accompany his parents in visiting Buddhist temples. Early in his childhood he was found to be very religious. It may be that his devoted mind was roused by the merits he has accumulated in his previous existences, so that he was inclined to renounce ther wordly life. He asked his parents permission to join the priesthood, but they having no other child could not acceed to his entreat which however was so earnestly repeated that sometimes it was accompanied by fasting. The father being moved with compassion on him, on the 8th of the 4th month of 1275, when the child was only 8 years old, took him to Ejô the Dhyâna-master (1198-1280), then abbot of the Eiheiji. For 5 years henceforth he was taught Buddhist doctrines and rules of deportment, and at the age of 13, he was conferred ordination. The master abbot was very glad to have such a promising pupil as he, and t s said at [sic] he once prophesied his futurity with the following words : "He is only a young novice, but no one will fail to see splendid talents in him ; he may therefore be expected to become an able leader of the human and celestial worlds, to rouse our sect to a still more prosperous condition." Not long after this, the master fell sick and died, entrusting the novice to his first disciple Gikai (1219-1309). He never forgot his young disciple ; at the dying moment he said, "I am afraid I shall not recover from my illness, which however does not dispirit me in the least. It is my great regret that I shall be unable to bring up this novice myself and see his promising futurity." The novice now took Gikai for his master and continued his study and practice under his guidance for several years. At the age of 18, with the permission of his master, he went out for Dhyâna culture under other masters, as the Dhyâna priests did in those days. At first he repaired to Jakuen the Dhyâna-master (died 1299), a Chinese high priest presiding over the priesthood at the Hôkyôji, Echizen. Spending one summer season with him, he went up to Kyoto, where he visited Hôkaku the Dhyâna-master (1231-1291) of the Manjuji monastery, Ekyô the dhyâna-master (1223-1297) of the Tôfukuji monastery, etc., all of whom are said to have been struck with his extraordinary abilities. He spent some time at Hieizan studying the Tendai doctrines and reading the Buddhist scriptures. Then, he passing one winter season with Hôtô the Dhyâna-master (1205-1298) of the Kôkokuji, Kishû, went back to his own master. In 1289, when he was 22 years old, his master removed to the Daijôji in Kaga, which had been newly converted from the Tendai sect to the Zen, whither he following him with his fellow-pupils continued his Dhyâna culture. One day while reading the Hokkekyô or Saddharmapundarîkasûtra, he found in it the passage : "With the carnal eye derived from his parents, he shall see all things in the 3,000 worlds," on which his mind became enlightened. He immediately repaired to the abbot's quarters to express himself about his enlightenment which however was denied by the master. Far from being discouraged by his master's denial, with renewed force, he made vigorous efforts in the practice of Dhyâna and in the study of the Buddhist scriptures. 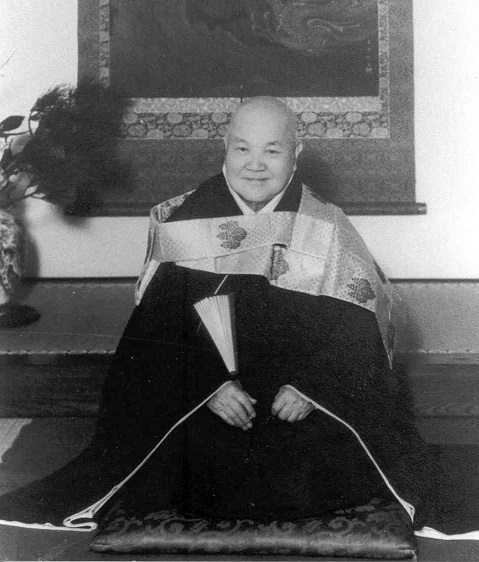 The following year Gikai the Dhyâna-master one day ascended the preacher's pulpit and preached about Chao-chou words : "The mind in every day life is the path itself," when the young priest came to perfect enlightenment, and involuntary exclaimed, "I have understood." "How hast thou understood ?" asked the master in a reproving way. Then followed some questions and answers, at the end of which the master admitted his enlightenment and said, "In the future, thou wilt rouse our sect to a more thriving condition." Then he was transmitted the Dharma that had been handed down from Sâkyamuni the Buddha down to his master, and was made the 54th Patriarch throughout India, China and Japan. The priest having obtained full mental enlightenment, the time now came when he should start teaching work for himself. In 1296 he was asked by the head officer of Kaibu district, Awa province, Shikoku, to come over there and teach the people in his dominion. A monastery of the name of the Jômanji being built for the new Dhyâna master, he stayed 4 years, showing the clergy and the laity the way to enlightement. When his master, at the Daijôji, became too old to be able to see to the monastic business and to guide the priesthood, he was urgently requested to return home to help the old master. He went back and presided over the prieshood for him. The Denkôroku or "Record of Transmitting Light", consisting of 53 chapters, was preached in these days. 3 years later Gikai the Dhyâna-master being 84 years old, resigned the abbotship to be succedeed by his able pupil, whose religious fame had by then spread far and wide, and in a few years the Daijôji was made a chief seat of Dhyânic culture in that age. In 1310, the Jôjûji belonging to some other sect was converted to the Sôtô doctrine to be dedicated to our Dhyâna-master. Shigeno Nobunawa and his wife who were earnest adherents of his offered him a portion of their estate in Sakai, Noto Province, where they constructed a small cell for his residence. In the following year, the Togashi family, the chief Dâyakas of the Daijôji offered him some money, which was accepted and a splendid monastery built on the site where the cell has stood. The monastery was named Yôkôji, and the Dhyâna-master was made his founder. The next year, the Kôkôji being established, he went round among the 4 monasteries : Daijô, Yôkô, Jôjû and Kôkô, and guided the cleric and laic on the way of enlightenment. In the village of Kukishi, in the same province, there was a Vinaya monastery, by the name Shogakuji, founded of by Gyôgi (670-749), a well-known ancient high priest. The abbot Jôken one night dreamed a wonderful dream in which Avalokitesvara made his appearance sending forth benign rays of compassion and pity and said in a sweet voice : "A great, good, wise priest who is the 54 Patriarch of Sâkyamuni the Buddha is now presiding over the priesthood at the Yôkôji and turning the wheel of the religious law. It is advisable to you to make your monastery over to him at once, and make it a chief seat of preaching the Buddha's teachings." The Master also dreamed nearly to the same effect, the identical Bodhisattva telling him that he would give him a monastery. Jôken moved with the miraculous information of Avalokitesvara, early the next morning was on his way to the Yôkôji. The Master also anxious to see what the dream on the previous night meant started on a journey towards the Shogakuji. Both met on the road and when they told each of his dream, their delightful wonder was great. Jôken dedicated all the buildings and estates belonging to the monastery to the Master. A grand ceremony of opening it and preaching the Dharma was celebrated. The religious fame of the Master had in the meantime spread far and wide. He was par excellence the most religious personnage in his age, when many Buddhist sects which had newly been established or introduced from China were all being strenuously propagated, and when prominent religious personages found themselves busy in preaching each his own doctrine. In the year 1321, when he was 54 years old, Godaigo the Emperor, bearing of his wide spread fame sent a messenger to him asking him 10 questions, chiefly concerning the Zen doctrines, the answers to which were so highly approved by the Emperor that he conferred on him a purple robe as a token of high esteem, and a tablet with 3 big characters, Sô-ji-ji, on the monastery. 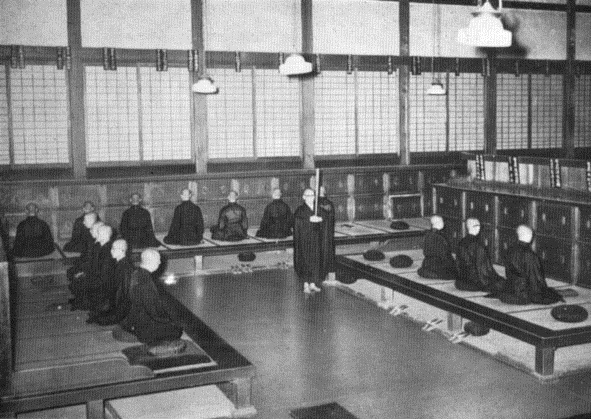 The following year the Emperor received the precepts at the hand of the Dhyâna-master, and the Sôjiji was promoted to the rank of an official monastery, as high as the Nanzenji, a Rinzai monastery, which had been put in the highest rank of all the Zen monasteries in the country by Kameyama the Emperor. It was made by the same Emperor the chief monastery of the sect, and the holy seat where Sôtô priests might get fully ordained. 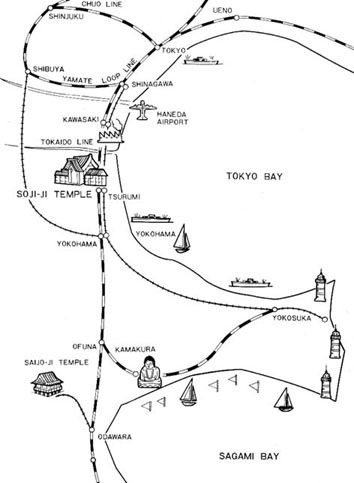 2 years later the Master prescribed 10 rules for the priesthood at the Sôjiji, and the next year he resigned the abbotship of the Sôjiji to be succeeded by Gasan, one of his prominent disciples, and himself retired to the Yôkôji, where on falling ill the next year in the middle of September he called together all his disciples, and again made over the abbotship of the latter to Meihô. He never gave up exhortating his disciples even at his last hours. He preached about the Hachidaininkaku or "8 Dharmas to be attained to by great men," as the Buddha and Jôyô the Imperial Teacher did each at the moment of his death. On the 28th, he conducted a ceremony of praising Arhats, and on the day following he attended a memorial service held in honour of his dead master. On the night of the same day he instructed his pupils with the words : "My teaching work having come to an end, the time is come when I should enter into Nirvâna. I wish all of you would make efforts in future not to let our Dharma decline." Taking a writing brush in his hand, he wrote a death-bed poem, which done be expired in sitting posture. Gasan and other disciples wailed and lamented over their master's death and so did the hundreds and thousands that assembled from far and near. His remains were cremated according to the Buddhist custom and distributed among the 4 monasteries, which had been presided over by him, to be buried there. 28 years later, Gomurakami the Emperor conferred upon him a posthumous name, Butsuji-zenji meaning "a Dhyâna master of Buddha's benevolence". And some 450 years later, Gomomozono-tennô gave him another posthumous title, Kôtôku-emmyô-kokushi , which may be loosely translated, "a National Teacher of Vast Virtue and Perfect Brightness." It was in year 1909 that the late Emperor or Meiji-tennô favoured him with a posthumous title Jôsai-daishi or "the Imperial Teacher of Constant Salvation." 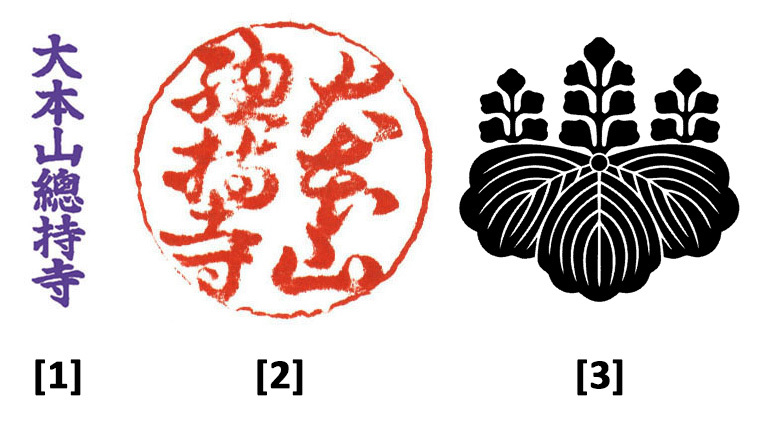 He wrote many books on Zen, of which following are best known ; the Denkôroku , referred to above, the Zazen-yôjinki , which we have translated in the following pages, the Sankon-zazensetsu , a work on Zen, the Shinjimmei-nentei , a commentary on the Hsin-hsin-ming of Seng-tsang, the 3rd Chinese patriarch, and the Shingi , rules of the priesthood under his guidance. Gasan the Dhyâna-master (1275-1365), who succeeeded the Master in 1324, retained the abbotship for 41 years until he died in 1365, at the end of which his 5 chief disciples occupied it one succeeding another after every 3 years. When these 5 passed away, the honour was shared by their respective religious descendants. The last named Dhyâna-master had 25 disciples including those 5 referred to above, who travelled all over the country for the good of others and themselves ; they preached the doctrines and established monasteries or converted those which had belonged to other sects to the Sôtô creed, so that the sect at present has the most monasteries of all the sects, with the single exception of the Shin sect. The peculiar institution of appointing abbot was observed until 1870, when it was totally abolished and Ekidô the Dhyâna-master (1805-1879) was nominated the first abbot, independant of the line of the founder and his immediate successors. 3 others have since succeeded him. The present abbot, the Rt. Rev. 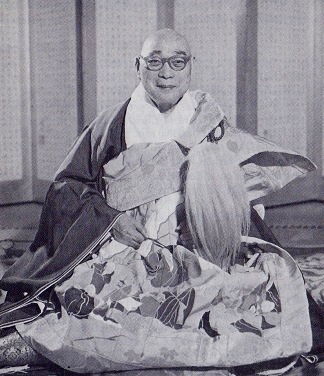 Ishikawa (born in 1841), on whom the late Emperor bestowed a tittle of honour, Daiengenchizenji, was appointed in the year 1905. In 1898, one night a disastrous fire broke out and burnt down almost all the buildings within the grounds. When a reconstruction was proposed, it was unanimously decided among the priesthood to remove the monastery somewhere near the capital, the centre of every form of activity, so that the followers may visit it oftener. A branch monastery was also decided to be built on the old site. The place in the village of Tsurumi, near the railway station of the same name, was selected as the site and the construction work, having been commenced in 1907, is still going on. 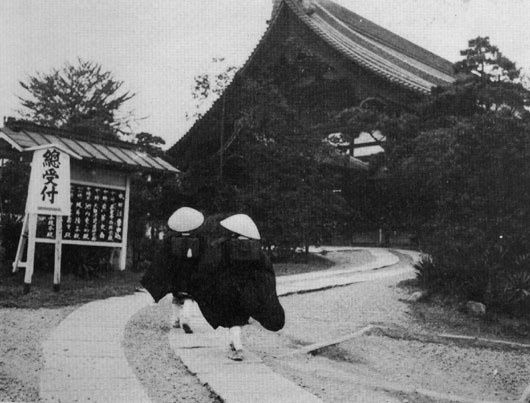 Up to the present (November, 1915), Butsuden or "Buddha"s Image-house," Hôkôdô or "Ray-emitting-hall," where spirit-tablets of Dâyakas' ancestors are to be kept, Shuryô or "Priests' dormitory," Oguri or "Larger kitchen," Koguri or "Smaller kitchen," and Shôrô or "bell-tower," have been completed or nealy completed. Other buildings, such as Taisôdô or "Sanctuary of the images of the 2 founders of the sect and their immediate successors," Shiuntai or "Abbot's quarters," Sôdô or "Meditation hall," etc., will be built in the near future.